There are some weeks and this has been one of those, when at the end of the week I feel flat and depleted. A little over whelmed by what I haven't been able to accomplish - too much school wide focus and not enough time to actually plan for my class programme. Opening my computer after school I view a video made by some of my students, and watch them teach about HCFs and LCMs. They do it well, however that's not what makes me smile and forget the weariness of the week. Rather it's the giggles that come as they share a few of their bloopers. Thanks guys. I needed that laugh. I wonder how long it is going to take them to figure out their factors of 57 are incorrect! I think they mean 56, at least I hope so! In the past week I read Breadcrumbs by Anne Ursu. I wasn't sure if I would like it as I was not a fan of the story The Snow Queen growing up. It was just a distant memory and I couldn't even recall the plot, just the distaste. 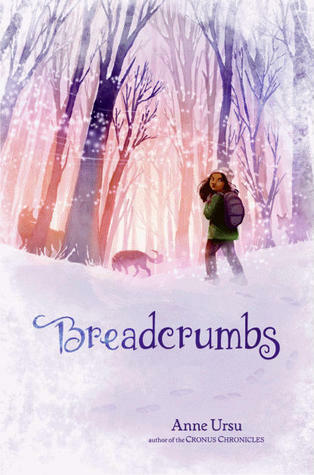 Breadcrumbs starts out as a realistic fiction novel but then becomes fantasy as it almost retells the story of the Snow Queen using the characters Jack and Hazel. I fell in love with both of them, so I was soon hooked into the story. About half way through I had to stop and go look up the story of the Snow Queen. On page 45 - 46 Jack talks about his drawing of a simple palace. "There's a boy," Jack said. "He's a normal boy. Until one day he wakes up and no one can see him. He's turned invisible. And he tries everything, but nothing works. So he goes there.......There's no one to look at him, and no one will ever come." Jack has a hard time at home, his mother has gone into a depression - where she is not available to Jack. He is an easy target for the Snow Queen. Hazel too has her troubles with a father who really does not care about her and has to see a counsellor when she acts out at school. At the end of the visit "He dismissed her, and Hazel poured concrete into the hollow parts. Now she would be part girl, part hardening gray sludge. And no one would know the difference." No "plastic flowers of words" really made a difference. Yet it is Hazel who courageously goes after Jack and saves him and brings him back. Her strong friendship with him matters. As he turns to go home, "Jack hesitated still and Hazel wanted to say something comforting, give him some bright plastic flowers of words, but Jack would see them for what they were. Jack know how to see things." To me the second part of the story was like a journey made within. It is as if Jack has gone into inner territory of coldness and ugliness. Hazel seeks him out there, bringing him back to reality, with no promise that all would now be okay. Yet there is that strong bond of friendship that has broken through. Hazel did come. For the coming week I plan to read The Mighty Miss Malone by C P Curtis. Looking forward to it. In January I took part in a quality commenting meme started at the Langwitches blog. I returned to school in February with renewed enthusiasm to teach and support my class to write quality comments. I have not expected them at this early stage to write blog posts. Rather I have put my efforts into teaching about quality commenting. Many of the students have made a flying start - the experienced ones. I still need to support those less experienced. I prepared the following slideshare, to use with my class. The slides I made contain comments from my students of last year. I am not sure if they were horrified to see them, but I was! View more presentations from Miskaytea. Here are a couple of comments left by students on the class blog. I am delighted with the stepping up that the students have managed since our exploration about commenting. Great video Miss T! What movie making tool did you use? I guess I’m very lucky getting the opportunity to go sailing! I’m also a little disappointed because for most of the day there wasn’t much wind so we had to skull. (using the rudder/steering to propel us along slowly) But when the wind picked up, Jordan and I went speeding across the waves. Hope we can do more of the same fun activities during the year, Antonio. I really enjoyed the the Yachting yesterday. It was fun, and wet. During the day, I had 2 partners, Cameron (before lunch) and Neo (after lunch). I ended up in 3 yachts though. 1,6, and 1. I really wanted to go in a red yacht, but they were all taken, so I used 2 white yachts instead. Dean was really fun, and enthusiastic about yachting. He made sure that he told us all the safety precautions, gave us all a life jacket, thermal under layer, and a water proof top. I really enjoyed the Yachting and I really want to do it again. Nice video, I really enjoyed the yachting as well. I was quite surprised about easy it was to get the yacht going. I held the sail while Monique steered. The hardest part of the day was getting in a line and swapping boats in the middle of the lagoon. The best part was the two races because Monique and I came first in one and second in the other. During the boat swap the boat Monique got into floated away from the one I was in, so for the second half I was with Cameron. The only negative of the whole day was almost suffocating in the terribly hot thermals underneath the bulky life jackets, and leaving to go back to school of course. The instructor , Dean was really nice, he gave me a ride on his boat and did spins and stuff. He made sure we were all completely safe at all times. The yachting was a great experience and I can’t wait to get the display up! Have you ever been on a yacht? All comments are far superior to anything written last year. Thank you to the initiator of the meme and a special thank you to Kathleen Morris. Monday comes around fast. It has been an extremely busy week, so I only found time to complete one book. 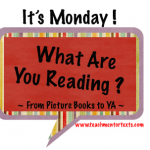 As usual I am joining in the blog hop over at Mentor Texts. 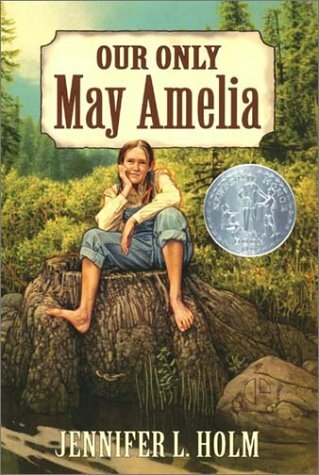 The book I read was called Our Only May Amelia by Jennifer Holm. It took me a little while to get into it and orientate myself. Eventually I sorted out her many brothers and began to follow more easily. It gave a wonderful historical perspective of a young girl growing up in Nth Western America in the early twentieth century. By mid-way through the book I was hooked and wanted to finish the remainder of it in one sitting. I am looking forward to reading the sequel. This week I am reading Breadcrumbs by Anne Ursu. Just started. I hope I like it, however I was never a fan of the Snow Queen so I am a little anxious about that. Classroom Setting Up - Week One. I have a new determination to be a little more organised with the way my classroom has items organised. I want to do this for ease of access for myself and my students. So at the end of week one of year we are on the way to being organised and clutter free! As we have no personal desk space, this year I have a bucket for each student. They can name it and carry it wherever they need to go. They have the option of removing the handles if they want. These were inexpensive - $2.18 each from Mitre 10. In it they have the books they are reading, their reading notebooks and writing notebooks, pencil cases and headphones. So far they are proving to be a very good option. I also found exactly the same buckets but in colour at Briscoes, on sale they worked out at $1.75. Each of these contains exercise books for such things as Maths, Religious Education, etc. I have containers marked with pencils, sharpeners, scissors, pens, plasters, rulers. The students have most of these themselves but every teacher knows that sometimes they don't! Also it is where I dip into when I need things. So we share. Notice student bucket being used! Here the students have decided what genre books are in the green container. They are making a label for it and adding stickers to the front covers so that they can easily return the books to the bin when they have finished reading it. It took us longer than I thought, however many hands make light work and it saved me a few hours. We only have a small class library, however this will slowly be added to as time goes by. We also access books from home, the school library, the local Kapiti library once a fortnight and the National School Library Service provides us with 30 books at a time. All in all I am very pleased with my decluttering! I am working at present on my desk space, which is a small desk for my computer and a small table. I want to sort that a little more so that I can readily access what I need. Perhaps a few nails in the wall coming up?! We have returned to a new school year here in New Zealand and while the time allotted to reading has dwindled I still managed to read two books and finish an audio. Every little counts and as my goal is generally one children's book a week I am very pleased. 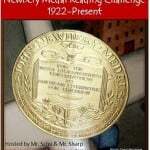 I am continuing to read the Newbery books that I can lay my hands on. This is the 2007 award winner. I enjoyed it, although I wouldn't personally buy it for the class library. 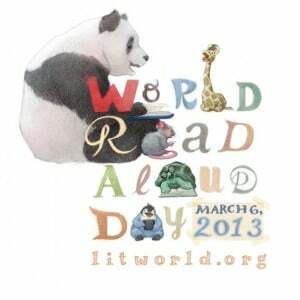 If a student wanted to read it they can access it from the local library as I did using my smart card. 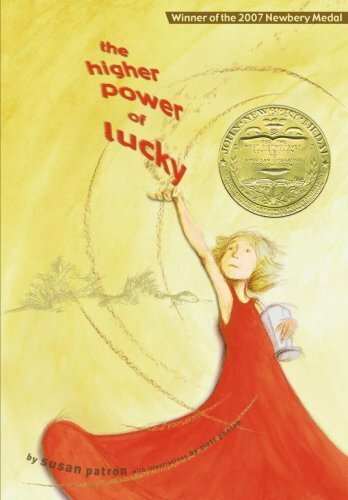 This was my second book of the week, the 2000 Newbery award winner. This was the first Newbery book so far that I really liked. 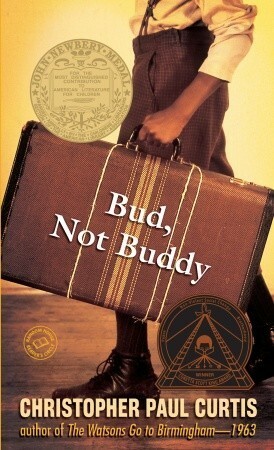 Bud was an endearing character and I wanted to pick up the book any spare moment I had so I read it very quickly. I chose it because I have The Mighty Miss Malone lined up ready to read in the near future. 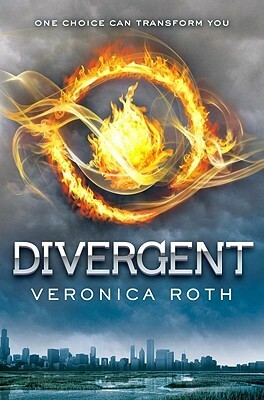 This one is a young adult book and the first one in a trilogy. I listened on audio and well.... I actually loved it. It was a big stretch for me as a reader as I hadn't ventured into anything dystopian. I will be eagerly anticipating the second in the trilogy which I think comes out in May. This coming week I hope to read Our Only May Amelia by Jennifer Holm and possibly Breadcrumbs by Anne Ursu. In response to a meme from Declairing It! Click on her blog to see the origin of the meme. I need my teacher to know I like a safe learning environment. I rely on you to initiate that, we can work together to maintain and build a safe learning environment, but I need your lead. I need to know deep within me that I can take the risk of being wrong and equally of being right. I never want to be embarrassed or made to feel uncomfortable by the teacher or my fellow classmates. I need boundaries set. I need my teacher to set boundaries that will help us all to stay safe and make it easy to learn. I need my teacher to be planned and prepared and to offer me an engaging learning environment. I like to be included in the planning and I like help to set and meet my learning goals. I like those goals and the work undertaken to be relevant to me. I need to be respected as an individual and I need my teacher to really see me. I need to know I am accepted as me and then to be challenged to be the very best me. I need my teacher to be human and his/herself. I need my teacher to allow me to be a human. We are all at times tired, annoyed, or fail to meet expectations. I appreciate an acknowledgement from my teacher when he/she gets it wrong. I am willing to make allowances for my teacher and I would like that too from my teacher. I need my teacher to really enjoy being with me in the classroom – happy to come to school each day. So what do you think a student would say that they need? This last week my class wrote our mission statement for the year. They certainly wanted to be accepted as themselves. If you have a blog and are reading this I invite you to have your say.